A pair of techno-thrillers featuring a special-forces op—from the USA Today–bestselling author and “one of the best all-out action writers in the business” (Los Angeles Review of Books). 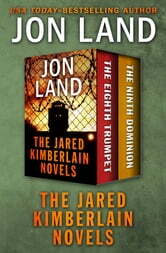 The Eighth Trumpet: When the world’s finest security systems fail to protect three of the nation’s most powerful businessmen—one is electrocuted, one blown up in his sleep, a third hacked to death—Jared Kimberlain, the government’s most feared special-forces operative, must come out of retirement to protect the president of the United States, who may be the next target. Soon Kimberlain finds himself facing an army of super-killers led by a madman. The Ninth Dominion: Jared Kimberlain is on the hunt for a serial killer named Tiny Tim—who executes entire towns—and an asylum’s worth of escaped convicts, including Kimberlain’s old nemesis, the vicious psychopath, Andrew Harrison Leeds.